"Palestine is our land and nation from the (Mediterranean) sea to the (Jordan) river, from north to south," says Hamas chief in Gaza. 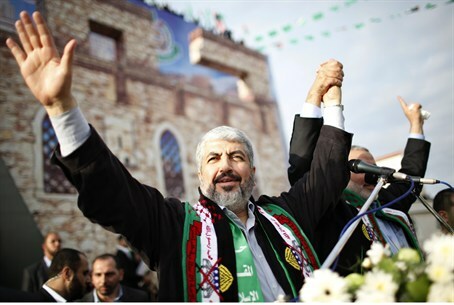 Hamas politburo chief Khaled Mashaal on Saturday rejected ceding "an inch of Palestinian territory” to Israel or recognizing the Jewish State, reported AFP. Mashaal, on his first ever visit to Gaza, made the remarks in a speech marking the 25th anniversary of the founding of the terror group. "Palestine is our land and nation from the (Mediterranean) sea to the (Jordan) river, from north to south, and we cannot cede an inch or any part of it," he said. "Resistance is the right way to recover our rights, as well as all forms of struggle -- political, diplomatic, legal and popular, but all are senseless without resistance," added Mashaal, according to AFP. Addressing the longtime rivalry between Hamas and the Fatah movement, headed by Palestinian Authority Chairman Mahmoud Abbas, he said, "We are a single authority, a single reference, and our reference is the PLO, which we want united." He was referring to the Palestine Liberation Organization, to which Hamas does not belong Mashaal said a year ago that it and other factions were "on the path to joining" it. In 2007, Hamas ousted Fatah forces from Gaza after several weeks of bloody street battles. The two factions have been fighting ever since. The parties attempted to resolve the feud between them when they signed a reconciliation deal in May of 2011. The deal has repeatedly faltered as the parties spar over its implementation. He said his visit to Gaza was his "third birth", referring to an assassination attempt by Israeli Mossad agents in 1997 as his previous "re-birth." The celebrations in Gaza come just over two weeks after an Egyptian-brokered truce ended Israel’s Operation Pillar of Defense, which targeted Hamas’s terror infrastructure in Gaza..
"We used only 10 percent of our capacity in the fighting," a masked spokesman for Hamas military wing the Ezzedine al-Qassam Brigades told the crowd, according to AFP. "If you had escalated (your attacks), so would we have," he told Israel. "We will cut the hand that extends in aggression against our people and leaders." A huge portrait of Hamas founder Sheikh Ahmed Yassin, killed by Israel in 2004, dominated the main stage on Saturday, as did one of Hamas military commander Ahmed Jaabari, whose targeted killing by Israel marked the beginning of the Gaza military operation. Between them was a model of an M75 rocket, of the sort Hamas terrorists fired at Israeli cities during the last escalation.